In 1890, ex-slave George Washington Fields became the first African- American to graduate from Cornell Law School. Nearly 125 years later, the Office of Academic Diversity Initiatives (OADI) continues to celebrate diversity at Cornell with a series of awards named after Fields and nine other Cornellian trailblazers. More than 70 people gathered May 1 for the second annual OADI Honors Awards Ceremony. Student presentations, a dinner reception and musical performances kicked off the event, which highlighted accomplishments and contributions of some of Cornell’s most talented scholars and leaders. OADI is pronounced “wadi,” which is an Arabic and Swahili word for a cool, protected passage through a desert, often formed by a seasonal river. 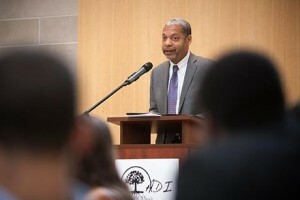 OADI was formed in 2011 as part of an initiative to provide support and mentorship to Cornell students who come from historically underrepresented backgrounds. “These services play a crucial role in fulfilling Cornell University’s ‘any person, any study’ motto,” said Carlos Gonzalez, executive director of OADI. Engineering Dean Lance Collins gave the keynote address for the awards ceremony. The first African-American dean at Cornell, Collins shared his insights on the role of diversity in the three core pillars of academic excellence: scholarship, leadership and community engagement. Collins encouraged the audience to seek mentors and to mentor others, to lead by inspiring others to take action, and to work for results rather than recognition. Andrew Martinez '12, assistant dean of students, 626 Center for Intercultural Dialogue – Ryokichi Yatabe Award for Outstanding Alumna/Alumnus Partner. Anthony Burrow, assistant professor, human development – Estevan Fuertes Award for Outstanding OADI Faculty Partner. Angel Keen, assistant director, Diversity Programs in Engineering – Tomás Bautista Mapúa Award for Outstanding OADI Staff Partner. Zarif Islam, M.P.S. candidate – Toni Morrison Award for Outstanding Graduate Mentorship. Scholars Working Ambitiously to Graduate (SWAG) – Club Brasileiro Award for Outstanding Organization. Kemar Prussien '15 – Solomon Cook Award for Engaged Research and Scholarship. Rachel Reindorf '16 – George Washington Fields Award for Professional Development. Andrea Kim '12– Gloria Joseph Award for Opportunity Programs Students. Allison Arteaga '18 – Marvin Jack Award for OADI Emerging Scholar-Leader. Misha Inniss-Thompson '16 – Jerome Holland Award for Outstanding OADI Scholar-Leader. Thaddeus Talbot '15 was selected as the student speaker for the awards ceremony. Earlier this year, Talbot marched in Selma, Alabama, to commemorate the 50th anniversary of the 1965 voting rights marches from Selma to Montgomery. “Tonight is all about taking risks and the rewards that follow,” said Talbot. Josephine Engreitz ’15 is a writer intern for the Cornell Chronicle. Posted in Features and tagged civil rights, cornell, Cornell University, cornell university college of human ecology, diversity, engreitz, fields, george, human development, joseph, OADI, race, selma, social justice, talbot, thaddeus, voting rights, washington on July 24, 2015 by Pooja Shah.